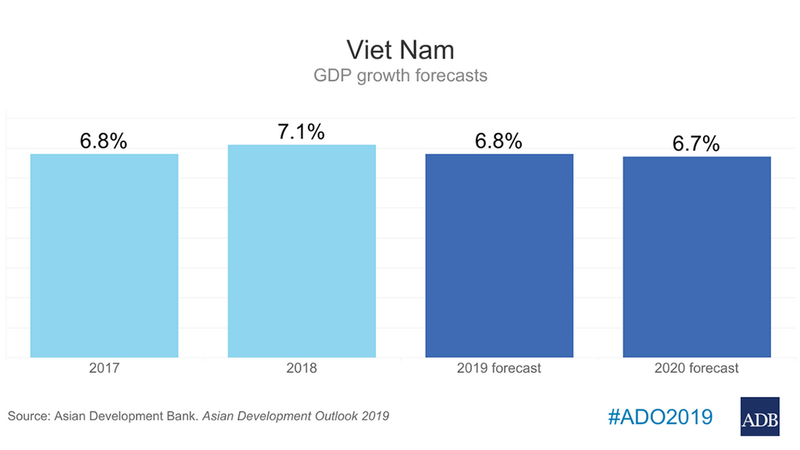 HA NOI, VIET NAM (03 April 2019) — Viet Nam’s economy experienced another year of strong growth in 2018, although a weaker external environment could affect the country’s growth outlook for this year and next, says a new Asian Development Bank (ADB) report launched today. Growth will continue to be broad-based, underpinned by robust private consumption, continued expansion of manufacturing, services, agriculture, and greater market access for Viet Nam’s exports through various free trade agreements, including the recently ratified Comprehensive and Progressive Agreement for Trans-Pacific Partnership. Inflation is expected to average 3.5% in 2019 and slightly accelerate to 3.8% in 2020. Risks however remain. The world’s major economies—Viet Nam’s key trading partners—are weakening. Viet Nam is one of the most trade-dependent countries in the region, with trade volume reaching twice the size of its gross domestic product. Domestically, lackluster progress in state-owned enterprises reform could be a drag on growth potential. The report underlines the importance for Viet Nam to strengthen private firms’ integration in the global value chains (GVCs), which is one of the key policy challenges for Viet Nam’s long-term growth. Improving small and medium-sized enterprises’ (SMEs) access to finance, and enhancing SMEs’ capability including workers’ skills, are among the important measures to enable SMEs to better adopt new technologies and have more value addition in GVCs.